Canaries : When and where to go? The climate of the Canaries is very mild from one end of the year to the other, with temperatures of 18 ° C on average in winter and 24 ° C during summer. It is obviously warmer on the beaches than in the mountains, and the southern islands generally offer a subtropical climate. On the whole, rainfall is rather rare, but there is more precipitation on the northern faces of the mountainous islands. In summer, the sirocco can blow intense and cover everything with dust, especially in the eastern islands. You can therefore visit the Canary Islands all year round, avoiding December and February if you want to avoid crowds and high prices, but also full summer, for the same reasons. The most splendid periods are spring and autumn. In Tenerife you can hike around the volcano of El Teide in a strange lunar landscape before taking the cable car to the summit lost in the clouds. On the same island, you will attend the carnival in Santa Cruz, which lasts three weeks in February, with parades and fireworks that have nothing to envy those of Rio. Also visit La Laguna and its historic district, its cobbled alleys, its houses with pine balconies, and its café terraces. In Fuerteventura, you will discover the most beautiful beaches of the Canary Islands, especially if you go to the northwest where they are still wild and beaten by the waves. Do not miss the valley Barrango de Guayadeque, on Gran Canaria, still green, and even more beautiful in spring when the almond trees are flowered. On Lanzarote you can taste Malvasia (or Malvasia) wine and visit the Wine Museum in La Geria, but also discover the art of César Manrique, a local artist, his metal sculptures, his former home and the two sites testifying to Its architecture, the Cueva de los Verdes and the Jameos del Agua. For sports enthusiasts and outdoor enthusiasts, there are many choices: surfing in particular at Lanzarote at the El Quemao reef with its famous wave and enormous rollers; Climb the summit Alto de Garajonay on La Gomera, at 1487 meters, for its fascinating spectacle once up; Dive to El Hierro, with its warm water and its amazing marine creatures; Take a cruise to observe whales and dolphins in the channel between Tenerife and La Gomera. The night owls will not be disappointed either, they will find something to drink and dance in Las Américas, an important seaside resort of Tenerife, and the gourmands will taste the specialties of La Gomera, like palm honey or Almogrote. EU citizens do not need a visa to enter the Canary Islands. Regarding your budget, the less demanding will be able to live for about 60 € per day, but count about a hundred euros if you want a double room in an average hotel and 3 real meals. To get to the Canary Islands, the plane is the most frequent means of transport used: flights arrive from all over Europe, and the seven islands of the archipelago each have an airport, some of which have international flights. You can also take a ferry from Spain. 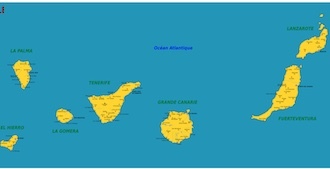 To travel to the Canary Islands, the plane allows to move quickly between the different islands. There are also fast ferries and hydrofoils. On the same island you can take the bus, but also go by bike. The simplest is however to rent a car or a motorcycle, especially as gasoline is inexpensive. Health: There is no particular health problem, just be sure to protect yourself from sunburn and mosquitoes. Security: There are no security problems in the Canary Islands, they are safe islands. The only dangers can come from the beaches, because some have strong currents, and so be vigilant. Shopping: the islands all have specialties, such as pottery, embroidery, basketwork, palm honey, wine, cheeses, almogrote and quesadillas.